I had to take a break to get the Christmas Tree decorated. We still have to get a new tree skirt to match the NEW ornaments Alyssa & I have been gathering for the last couple of weeks. Finally got back into the stamp room to finish up the cards for club. Card #3 is a TOTAL CASE from Barb Mullikin. I loved the idea of using pastels on the dry embossed image. I used a Versamarker to color the embossed image before I put the chalk on so I get a Poppin' Pastels look. 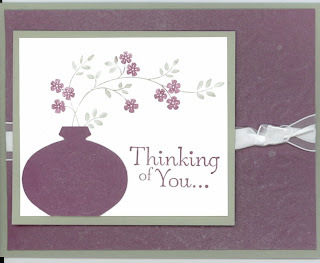 I used Curvy Verses for the greeting...one of my favorite staple stamp sets. 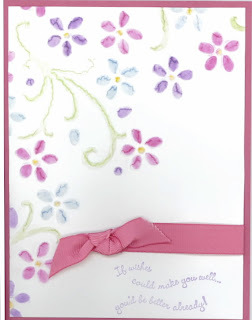 For Card #4 I decided we needed to do some more dry embossing so I used the Damask texture pad. The colors are Rich Razzleberry, Mellow Moss, & Whisper White. I used Thoughts and Prayers stamp set. Because I love bling bling I sprayed the textured Rich Razzleberry pieces with a rubbing alcohol Platinum Shimmer paint mixture. Your blog looks great!! You're becoming a pro at this! !